Nitrofurazone ointment is used topically for the prevention or treatment of surface bacterial infections in wounds, burns and cutaneous ulcers. May also be used as a sweat. Federal law prohibits the use of this product in food-producing animals. For use on Horses. 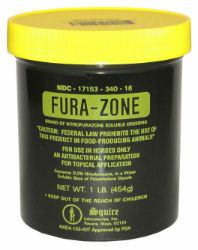 Apply Fura-Zone directly to the lesion with a spatula, or first place on a piece of gauze. Application of a bandage is optional. Fura-Zone should be in contact with the lesion for at least 24 hours. The dressing may be changed several times daily or left on the lesion for a longer period.